When Randy Woodson became chancellor in 2010, he issued a challenge to NC State University’s alumni networks to grow their local bases. In Beaufort County, Paige Harris and her friend, Lalla Hodges Sidbury, put their heads together and came up with a plan for a fun, laid-back oyster roast to bring together their area’s alumni community. That first year, roughly 75 people attended, and the pair hosted the event at Sidbury’s home. Thanks to their efforts, the chancellor recognized the Beaufort County Alumni Network as the Alumni Network of the Year. Woodson attended the oyster roast and enjoyed it so much that he promised to return each year. And each year, he does – often bringing other guests from the university, such as NC State basketball great Dereck Whittenburg or head baseball coach Elliott Avent. The event has grown each year, with about 250 people in attendance this past January. Harris is largely to thank for making it all happen – from a feast of oysters, shrimp and seafood chowder, to the music of a local band and the fun of take-home Wolfpack giveaways. “We try to do something a little different each year – whether it is the food, the entertainment or the guest speakers. It just depends on what we can arrange,” Harris said. The event is only one of the ways that Harris, who grew up an NC State fan thanks to her alumnus father, conveys energy and excitement about the university not just to alumni but to future students as well. She currently serves as vice president of the Alumni Association Board of Directors and, in January, will become board president. Her role as board president isn’t Harris’s first leadership role at NC State. In the late 1980s, she enrolled as a student to study political science and history. She became heavily involved in student government, serving in the student senate. She also served the Student Government Association as assistant attorney general, then executive assistant attorney general, before being elected to the attorney general position. She left NC State before graduating, feeling uncertainty about her career path, but she credits NC State with shaping her future. Harris went on to graduate elsewhere, and earned a graduate degree in English women’s history, later teaching at Wake Technical Community College. Her husband, Scott, a graduate of NC State’s College of Natural Resources, then asked her to move back to eastern North Carolina, where she had grown up. She taught history online for several years, a job that allowed her to stay home with her two children when they were young. Later, she ended up going into business with her brother. They now operate multiple locations of their family insurance agency. Paige with her family at this year’s Legacy Luncheon hosted by the NC State Alumni Association. Pictured from left to right: Abigail, Scott, Paige and Simon. 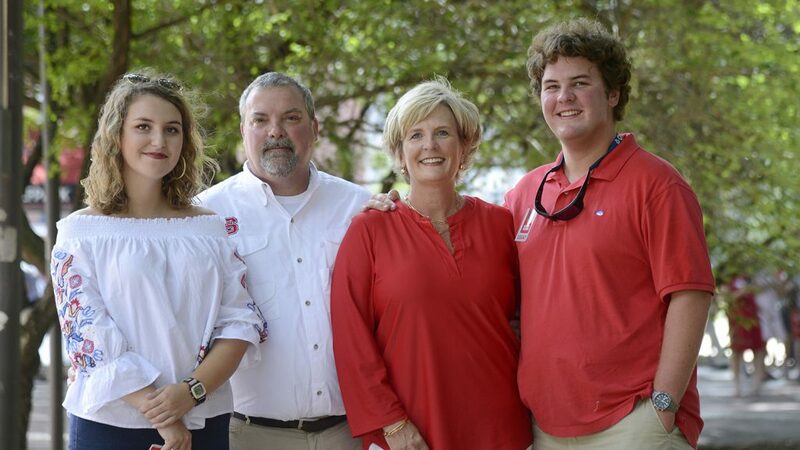 Harris said she wasn’t as involved with NC State when her children were small, but now that they’re older – her son enrolled as a freshman at the university this fall – she’s spreading energy and enthusiasm for NC State to alumni and prospective students alike. She has led the Wolfpack Welcome for more than 10 years, and said she finds it very fulfilling to welcome freshmen, then see what they accomplish in their time at NC State. Among her financial contributions to the university, Harris honors Sidbury by giving to the Lalla Hodges Sidbury Memorial Scholarship Endowment, which supports NC State students from the Beaufort County area based on merit and financial need. Giving back is something that comes naturally from the way she was raised. And giving back is about pride, too.